Andhra Pradesh Service Commission has invited online applications from eligible candidates to fill up 748 AEE Posts. The online applications start from 18th Aug to 21st Sept. 2016. 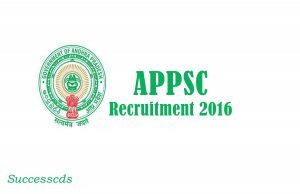 Interested applicants may refer the APPSC Official Site www.psc.ap.gov.in for more details regarding APPSC Recruitment 2016. The complete detail of Andhra Pradesh PSC AEE Recruitment 2016 such as eligibility criteria, pay scale, and online application process etc are mentioned below. Bachelor’s Degree in relevant Engineering discipline from a University in India established or incorporated by or under a Central Act, State Act or an Institution Recognized by the University Grants Commission or its equivalent.